The New York flagship of the Italian kitchen brand Cesar has introduced a new cabinet line that includes a freestanding island and units made from aluminum. 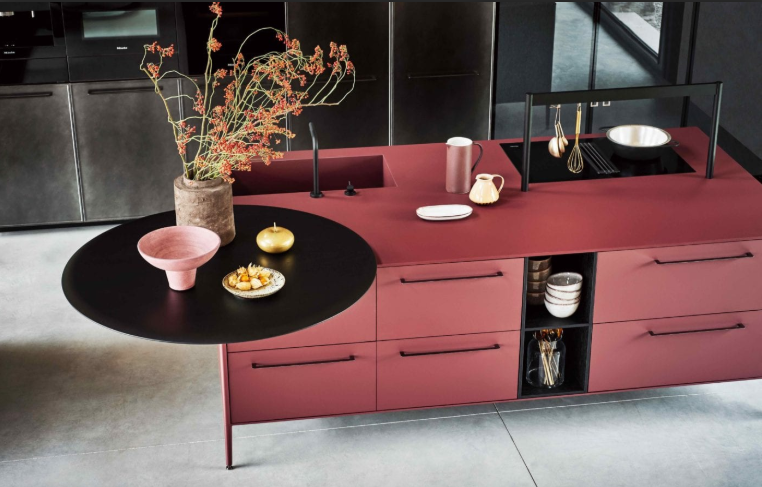 The Unit Kitchen combines an island in Red Fenix laminate and metallic-effect wall cabinets. It includes a combination of finishes, .8-inch-thick doors, and aluminum. The company says the line consists of exclusive Cesar design elements that were reinvented and redesigned in a completely new way. 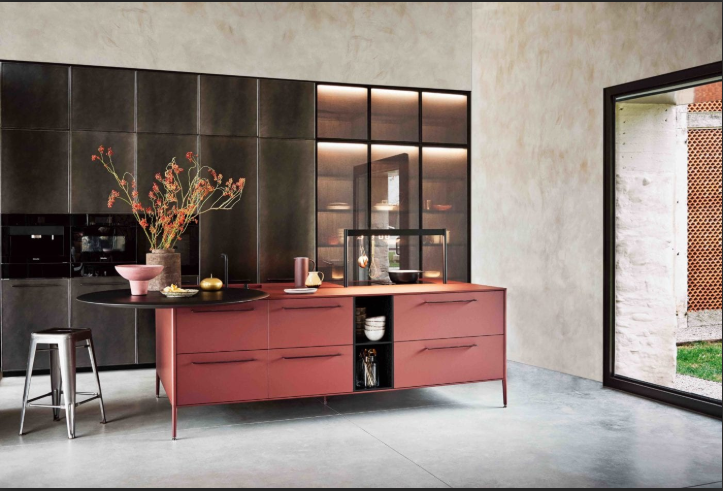 “A special focus is to be put on the new, innovative cabinet finishes that include Rosso Jaipur Fenix Laminate for the kitchen island, worktop and cabinet doors, Acciaio Ossidato Metallic Effect Lacquer for the shaker cabinet doors and Rovere Corvino for the breakfast bar and the table,” Cesar says. All cabinet doors Eero Gloss Nickel Nero Brass handles and some of the wall cabinets are made of Smoked Glass with fabric. “What makes this kitchen so unique are also the worktop made of brushed Nero Marquinia Marble, the Rovere Corvino round breakfast table integrated into the kitchen island, and the open compartments that can be customized as part of the kitchen island as well as the tall cabinets, and hence become something never seen before in the international kitchen design industry,” the company adds.